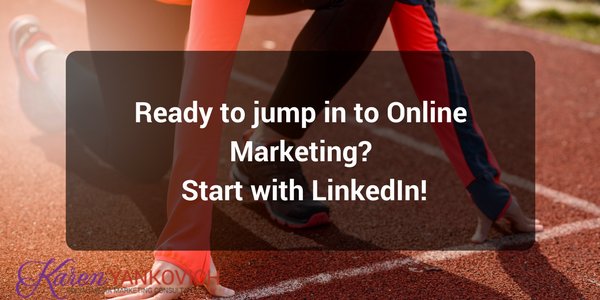 When you’re considering using online marketing to promote your business, you need to start with Linkedin. Hear me out. You’ve made a decision to start a business. You have a great concept, doing something you’re passionate about. You’ve been hustling and you’re ready to roll! And you don’t want to be the best kept secret in town for sure. You recognize that if you don’t create some kind of visibility plan it will take a LOT longer to achieve your first milestone. So you turn to social media. You’ve seen your competitors promoting their business on social media, heck, you can’t watch a TV show without being encouraged to tweet a hashtag! You’re now wondering where to start. You’re thinking you need a Facebook page, maybe also Instagram, and you’re wondering if you can leverage your love for Pinterest. You spend some time searching the Internet for some guidance and you’re hearing things like “be where your clients are hanging out” and “all businesses need a Facebook page”. And then you come across this article. And you’re thinking “LinkedIn? REALLY Karen? In 2017, business is more personal. SALES is more personal. Really. Here’s three reasons why. 1. When you make the decision to invest time and money in a digital marketing campaign, you’re making the decision to be more visible. When you make a decision to be more visible, you must understand that people are going to want to know more about you. How do they find that information? Google.Here’s the deal! You are NOT at the mercy of Google. You can CREATE the results you want your prospective customers to see. Throw my name in a Google search and take a look for yourself. My LinkedIn profile comes up SECOND only to my website. I’m telling you exactly what I want you to know about me, in an expert and confident fashion. You have control. Use that control! 2. Often I see people jumping right to an online marketing campaign promoting their business on social media, their products and services. I get that instinct! We want to believe it’s not about us, it’s about our great yoga classes. WRONG. This is not 1975 where we had no interest in whether or not the IBM sales guy that came in to our office was married or not. In 2017, business is more personal. SALES is more personal. We want to know more about the people we do business with, and we want to do business with successful confident people.YOU, as the business owner, have to give your prospects what they want. Help them feel comfortable buying from you. A strong personal brand immediately elevates your business brand. Even when you’re just coming out of the gate. P.S. Personal doesn’t mean you have to share things that you’re not comfortable sharing. You get to choose. 3. A strong presence on LinkedIn immediately elevates your level of professionalism to the world. Did you recently decide to join a Direct Sales Team, and NO ONE is worried about their LinkedIn profiles in your upline? Imagine if you’re the person who DOES create and market with a strong profile? One that not only shares your passion for your product, but your passion for team building? For supporting your downline? Showcases your years of relevant (or not so relevant, with a spin) experience? You will immediately stand out from the crowd.Your online marketing sphere of influence will take your business much more seriously than the person down the street who jumped right to Facebook marketing. How amazing would that be for your business? Especially when you start deliberately building a LinkedIn network full of valuable prospects? Of course you can still leverage Twitter, Facebook, Instagram, Pinterest, whatever brings you joy. First though, secure your business and your business reputation with a solid LinkedIn profile that will set your business off on the right digital foot. Of course I’m there to support you! If you’re not sure where to start, I’ve got you covered with my free 21 day LinkedUp Revolution challenge. It’s chock full of simple online Linkedin branding and marketing strategies to revolutionize your business successes. I am here for you and for your business.